Like apparently most of America, the kiddo and I made it out to see The Lego Movie this weekend, and we both enjoyed the heck out of it. The script was funny and imaginative, taking some pretty well-worn kids movie story beats (Be Yourself! Embrace Creativity! Everyone Has Something Special About Them!) and keep them interesting. The casting was just about perfect, from the main characters right on down to the bit players (in my head, that's how Green Lantern has been for years). And, of course, visually it was amazing, good enough to make you think that the nearly 4 million unique virtual bricks used in the movie - over 15 million virtual bricks total (via) - existed in real space, not just in some computer somewhere. We're both looking forward to seeing it again to pick up on all of the things we missed while laughing at other stuff, as well as all of the Easter eggs we surely missed the first time. Also, I'm pretty sure we're already driving my wife crazy by shouting "SPACESHIP!!!" at each other a dozen times a day, but I don't see that stopping soon. Sorry, honey. This will get pretty SPOILERY. So if you haven't seen it yet, skip the section in between the picture of the cast looking confused and the picture of Benny the 1980-Something Blue Spaceman about to realize his movie-long dream. Okay, so in the final act of the movie (See? I said there'd be spoilers! 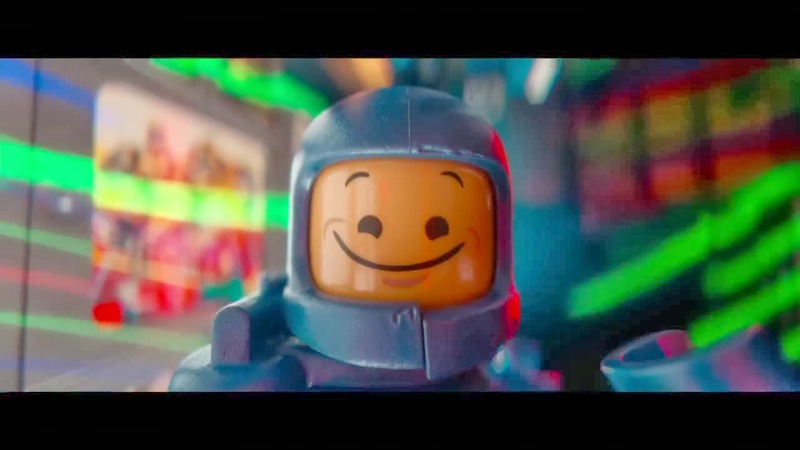 ), we learn that the entire plot of the movie is taking place in the imagination of a kid named Finn as he plays in his Jerk Dad's giant AFOL (Adult Fan of Lego) Basement Paradise Lego Set-Up (we know Jerk Dad is a Jerk Dad because his Basement Paradise Lego Set-Up has signs everywhere that say "Hands Off!" and "Do Not Touch!"). Right after we learn this, Jerk Dad comes home and is upset to find Finn has been disassembling and rebuilding parts of the Basement Paradise Lego Set-Up to tell his story. Stuff happens, of course, and Jerk Dad begins gluing everything in place so it can't be taken apart again, but he starts to really look at Finn's handiwork and gets impressed by it (because, yeah, the stuff this kid was making was pretty awesome), and in the end we all learn an important lesson about sharing our hobbies (and our Lego) with our kids, and maybe to stop worrying about following the instructions and just play creatively. These are lessons I wholeheartedly agree with, endorse, and attempt to practice in everyday life (though admittedly I may limit access to some of the more important-to-me parts of my own Lego stash - which is SIGNIFICANTLY smaller than my son's, I might add - because the kid tends to lose things). Two things, though. 1. For a movie that spends its entire running time driving home the point that there's no one way to play with this toy, that you can do ANYTHING with this toy... it does spend the last 20 minutes or so unironically lecturing you on how you should be playing with this toy. For all his faults? Jerk Dad's Basement Paradise Lego Set-Up is quite an achievement, you guys, and if he wants to slavishly recreate cityscapes in impressive detail, maybe that's kind of his prerogative so long as he's not a complete Jerk Dad about it to his kids? 2. For a movie that spends its entire running time driving home the point that you should step beyond the instructions and build creatively, it does have a rather impressive (and equally unironic) marketing push for tie-in Lego sets in which you are encouraged to follow instructions and recreate the builds from the movie in slavish detail. 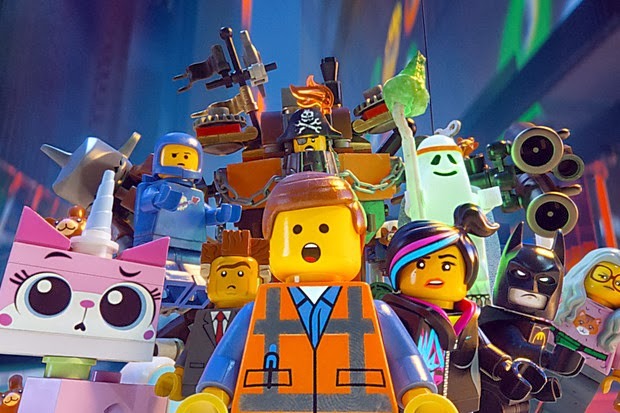 But those puzzling bits aside, The Lego Movie is a good time, one of those things that's actually worth leaving the comfort of your home to experience (and with a winter like the one we're having, I think that's saying something). Skip 3D, though... it doesn't add as much to the experience as you'd hope.